We have put together a range of unique experiences which are perfect for Youth groups, Church groups, children’s birthday parties and quality family days out! Make a childhood dream come true! The day starts off by getting kitted out with our hats and boots before heading to the stable to meet our horses. Here we will take everyone through basic horse safety before learning how to lead, feed, groom, plat and tack up our horses. After, it’s off to the arena to mount up, enjoy a short lesson and continue our adventure out in the tracks and hills above our centre. Once back in the arena, its time to master the rising trot which is sure to get everyone smiling and makes for a great way to finish your child’s dream day at Sheans. *This package can be tailored to suit all age groups from 4+. Delve into a Wild West adventure. This really is an adventure that your kids won’t forget! It is perfect for youth groups/ Church groups or as a family day out where parents can take part also. Get into character with the brief for the day ahead and get kitted out with our cowboy hats and scarves. All good cowboy and cowgirls should know how to look after and ride their horse so take the time to learn the basics and then it’s off to scout the land on horseback. You will make tents, prepare a fire, toast marshmallows, dam our stream, make fishing rods, fish and pan for real cowboy gold. This package is unique, loads of fun and makes for a fantastic day out. 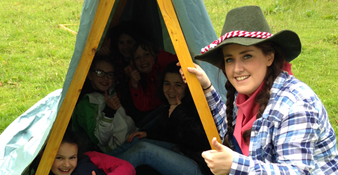 *A cowboy supper can be added for £8pp or you are welcome to bring your own picnic. Learn to groom, tack up and care for your horse before heading out on a trek around the farm. 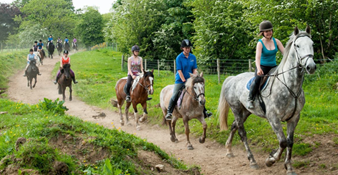 Finish off in the arena by learning to trot and then enjoy some games on horseback. 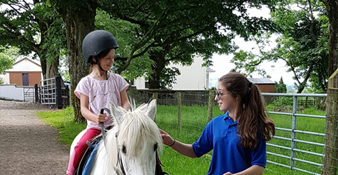 These games are suitable for total beginners and are make for a brilliant, fun-filled afternoon of bonding, both with horses and friends. Spend a unique day with us and jump into some of our favourite farming activities. 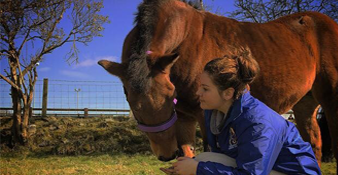 Meet our team of horses and learn how to groom, feed and tack them up, enjoy a horse riding trek through the farm before heading to the bog to cut some turf for the fire. Meet and help look after our sheep and hens and then its off to our river to pan for real North Antrim gold. 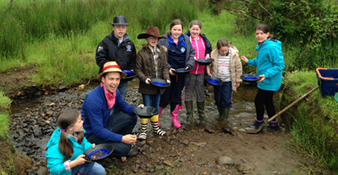 The Package includes gold panning, hen catching, sheep chasing, horse care, peat cutting, farming games, horse riding and makes for a funfilled and unique day out with your group.